[SatNews] Sierra Nevada Corporation (SNC) has amended its current Space Act Agreement (SAA), adding a significant development milestone to the Commercial Crew Integrated Capability (CCiCap) partnership with NASA. The amendment, which extends the period of performance through March 2016, introduces unfunded Milestone 41, Design Analysis Cycle-6 Closeout Review—demonstrating the advancement of the Dream Chaser® Space System design from a Preliminary Design Review (PDR) level of maturity toward a Critical Design Review (CDR) level. The Dream Chaser has been under development in partnership with NASA’s Commercial Crew Program since 2010. 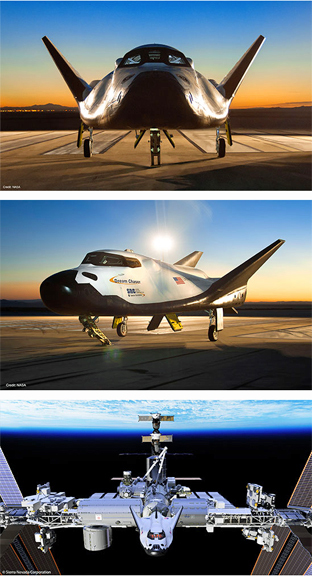 SNC’s Dream Chaser is the only reusable, lifting-body, low-g, and runway-landing-capable spacecraft in the world. It offers a reliable, cost-effective solution for transportation of crew and cargo to low-Earth orbit.